It is possible to draw substantial amounts of energy from the local environment and use that energy to charge batteries. Not only that, but when this method of charging is used, the batteries gradually get conditioned to this form of non-conventional energy and their capacity for doing work increases. In addition, about 50% of vehicle batteries abandoned as being incapable of holding their charge any longer, will respond to this type of charging and revive fully. This means that a battery bank can be created for almost no cost. However, while this economic angle is very attractive, the practical aspect of using batteries for any significant home application is just not practical. Firstly, lead-acid batteries tend to get acid all over the place when repeatedly charged, and this is not suited to most home locations. Secondly, it is recommended that batteries are not discharged more rapidly than a twenty hour period. This means that a battery rated at a capacity of 80 Amp-hours (AHr) should not be required to supply a current of more than 4 amps. This is a devastating restriction which pushes battery operation into the non-practical category, except for very minor loads like lights, TVs, DVD recorders and similar equipment with minimal power requirements. The main costs of running a home are those of heating/cooling the premises and operating equipment like a washing machine. These items have a minimum load capacity of just over 2 kW. It makes no difference to the power requirement if you use a 12-volt, 24-volt or 48-volt battery bank. No matter which arrangement is chosen, the number of batteries needed to provide any given power requirement is the same. The higher voltage banks can have smaller diameter wiring as the current is lower, but the power requirement remains the same. This brings home the value of devices like the Wang Shum Ho 5 kW permanent magnet motor-generator which is compact and requires no fuel or batteries to operate. However, the pulsed-charging systems are important as they show us features of the local energy field and how to tap it. With this system, the rotor is started spinning by hand. As a magnet passes the triple-wound "tri-filar" coil, it induces a voltage in all three coil windings. 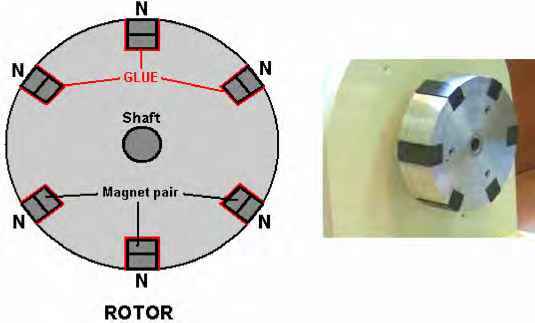 The magnet on the rotor is effectively contributing energy to the circuit as it passes the coil. One winding feeds a current to the base of the transistor via the resistor 'R'. This switches the transistor hard on, driving a strong current pulse from the battery through the second coil winding, creating a 'North' pole at the top of the coil, boosting the rotor on its way. As only a changing magnetic field generate a voltage in a coil winding, the steady transistor current through coil two is unable to sustain the transistor base current through coil one and the transistor switches off again. 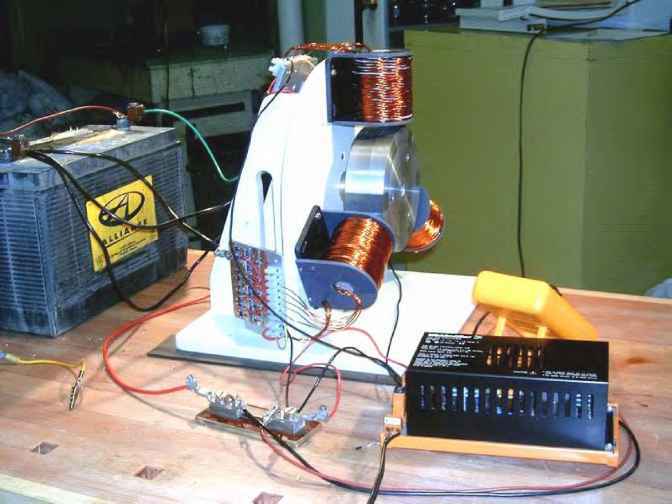 The cutting of the current through the coil causes the voltage across the coils to overshoot by a major amount, moving outside the battery rail by a serious voltage. The diode protects the transistor by preventing the base voltage being taken below -0.7 volts. The third coil, shown on the left, picks up all of these pulses and rectifies them via a bridge of 1000V rated diodes. 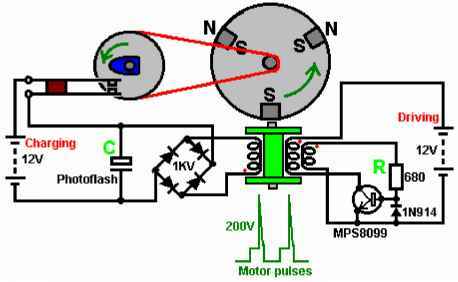 The resulting pulsing DC current is passed to the capacitor, which is one from a disposable camera, as these are built for high voltages and very rapid discharges. The voltage on the capacitor builds up rapidly and after several pulses, the stored energy in it is discharged into the "Charging" battery via the mechanical switch contacts. The drive band to the wheel with the cam on it, provides a mechanical gearing down so that there are several charging pulses between successive closings of the contacts. The three coil windings are placed on the spool at the same time and comprise 450 turns of the three wires (mark the starting ends before winding the coil). The operation of this device is a little unusual. The rotor is started off by hand and it progressively gains speed until its maximum rate is reached. The amount of energy passed to the coil windings by each magnet on the rotor stays the same, but the faster the rotor moves, the shorter the interval of time in which the energy is transferred. 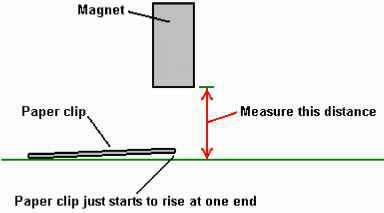 The energy input per second, received from the permanent magnets, increases with the increased speed. If the rotation is fast enough, the operation changes. Up to now, the current taken from the 'Driving' battery has been increasing with the increasing speed, but now the driving current starts to drop although the speed continues to increase. The reason for this is that the increased speed has caused the permanent magnet to move past the coil before the coil is pulsed. This means that the coil pulse no longer has to push against the 'North' face of the magnet, but instead it attracts the 'South' pole of the next magnet on the rotor, which keeps the rotor going and increases the magnetic effect of the coil pulse. John states that the mechanical efficiency of these devices is always below 100% efficient, but having said that, it is possible to get results of COP = 11. Many people who build these devices never manage to get COP>1. It is important to use the transistors specified in any of John's diagrams, rather than transistors which are listed as equivalents. Many of the designs utilise the badly named "negative resistance" characteristics of transistors. These semiconductors do not exhibit any form of negative resistance, but instead, show reduced positive resistance with increasing current, over part of their operating range. It has been said that the use of "Litz" wire can increase the output of this device by anything up to 300%. Litz wire is the technique of taking three or more strands of wire and twisting them together. This is done with the wires stretched out side by side, by taking a length of say, three feet, and rotating the mid point of the bundle of wires for several turns in one direction. This produces clockwise twists for half the length and counter-clockwise twists for the remainder of the length. Done over a long length of wire, the wires are twisted repeatedly clockwise - counter clockwise - clockwise - counter clockwise - ... along their whole length. The ends of the wires are then cleared of their insulation and soldered together to make a three-strand cable, and the cable is then used to wind the coils. This style of winding modifies the magnetic and electrical properties of the windings. It has been said that taking three long strands of wire and just twisting them together in one direction to make a long twisted three-strand cable is nearly as effective as using Litz wire. The websites www.mwswire.com/litzmain.htm and www.litz-wire.com are suppliers of ready made Litz wire. CAUTION: Care must be taken when working with batteries, especially lead-acid batteries. A charged battery contains a large amount of energy and short-circuiting the terminals will cause a very large current flow which may start a fire. When being charged, some batteries give off hydrogen gas which when mixed with air is highly dangerous and which could explode if ignited by a spark. Batteries can explode and/or catch fire if grossly overcharged or charged with an excessively large current, so there could be danger from flying pieces of the casing and possibly acid being thrown around. Even an apparently clean lead-acid battery can have caustic traces on the case, so you should be sure to wash your hands thoroughly after handling a battery. Batteries with lead terminals tend to shed small fragments of lead when clips are put on them. Lead is toxic, so please be sure to wash your hands after handling any part of a lead-acid battery. Remember too that some batteries can develop slight leaks so please protect against any leakage. If you decide to perform any experiments using batteries, that you do so entirely at your own risk and on your own responsibility. This set of documents is presented for information purposes only and you are not encouraged to do anything other than read the information. Also, if you get one of John's pulse motors tuned correctly, it will accelerate to perhaps 10,000 rpm. This is great for picking up energy but if ceramic magnets are used, the speed can cause them to disintegrate and fly in all directions. People have had magnet fragments embedded in their ceiling. 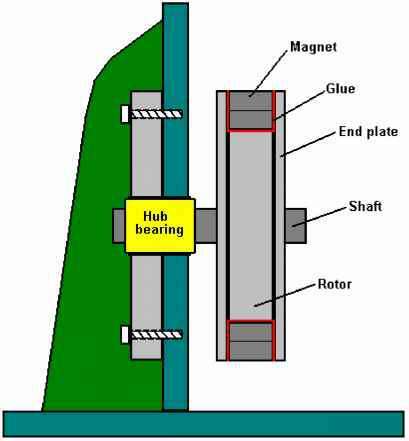 It would be wise to build a housing enclosing the rotor and magnets so that if the magnets disintegrate, all of the fragments are contained safely. I have not heard of anyone having a catastrophic failure of a battery case in all the energy groups to which I belong and most of them use batteries in the various systems which I study. However, that does not mean that it cannot happen. The most common reason for catastrophic failure in the case of a lead-acid battery, is arcing causing failure in the grids which are assembled together inside the battery to make up the cells of the battery. Any internal arcing will cause a rapid build up of pressure from expanding Hydrogen gas, resulting in a catastrophic failure of the battery case. I am a former maintenance engineer for U.S. 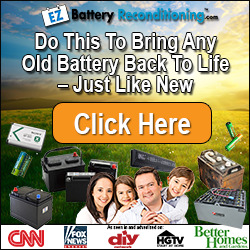 Batteries, so I can say with confidence, that when you receive a new battery from at least that manufacturer, you receive a battery which has undergone the best test available to insure the manufacturer that he is not selling junk which will be sent back to him. It is a relatively easy test, and as it takes place during the initial charge, there is no wasted time nor is there one battery that escapes the pass-or-fail test. The battery is charged with the absolute maximum current which it can take. If the battery does not blow up due to internal arcing during the initial charge it is highly likely that it will not blow up under the regular use for which it was designed. However, all bets are off with used batteries that have gone beyond their expected life. I have witnessed several catastrophic failures of battery cases daily at work. I have been standing right next to batteries (within 12 inches) when they explode (it is like a .45 ACP pistol round going off) and have only been startled and had to change my under shorts and Tyvek jump-suit, and wash off my rubber boots. I have been in the charge room with several hundred batteries at a time positioned very closely together and have seen batteries explode almost every working day and I have never seen two side by side blow, nor have I ever seen one fire or any flash damage to the case or surrounding area as a result. I have never even seen a flash but what I have seen tells me it is wise to always wear eye protection when charging. I have my new gel cells in a heavy plastic zip-lock bags partly unzipped when in the house and in a marine battery box outside in the garage, that is just in the remote chance of catastrophic failure or the more likely event of acid on the outside of the battery case. Vented batteries are always a risk of spillage which is their most common hazard, they should always be in a plastic lined cardboard or plastic box with sides taller than the battery and no holes in it. You would be surprised at how far away I have found acid around a vented lead acid battery under charge. Have an emergency plan, keep a box of baking soda and a water source around to neutralise and flush the acid in case of spillage. It is best to have plastic under and around wherever your lead-acid batteries are located. Ronald Knight gets about fifteen times more power from his Bedini-charged batteries than is drawn from the driving side of the circuit. 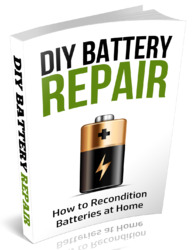 He stresses that this does not happen immediately, as the batteries being charged have to be "conditioned" by repeated cycles of charging and discharging. When this is done, the capacity of the batteries being charged increases. Interestingly, the rate of current draw on the driving side of the circuit is not increased if the battery bank being charged is increased in capacity. This is because the power which charges the batteries flows from the environment and not from the driving battery. The driving battery just produces the high-voltage spikes which trigger the energy flow from the environment, and as a consequence of that the battery bank being charged can be a higher voltage than the 12-volt driving battery, and there can be any number of batteries in the charging bank. Ron Pugh's Charger. John Bedini's designs have been experimented with and developed by a number of enthusiasts. This in no way detracts from fact that the whole system and concepts come from John and I should like to express my sincere thanks to John for his most generous sharing of his systems. Thanks is also due to Ron Pugh who has kindly agreed for the details of one of his Bedini generators to be presented here. Let me stress again, that if you decide to build and use one of these devices, you do so entirely at your own risk and no responsibility for your actions rests with John Bedini, Ron Pugh or anyone else. Let me stress again that this document is provided for information purposes only and is not a recommendation or encouragement for you to build a similar device. This is not a toy. It draws significant current and produces substantial charging rates. This is how Ron chose to build his device. The rotor is constructed from aluminium discs which were to hand but he would have chosen aluminium for the rotor if starting from scratch as his experience indicates that it is a very suitable material for the rotor. The rotor has six magnets inserted in it. These are evenly spaced 60 degrees apart with the North poles all facing outwards. The magnets embedded in the outer edge of the rotor are acted on by wound "coils" which act as 1:1 transformers, electromagnets, and pickup coils. There are three of these "coils", each being about 3 inches long and wound with five strands of #19 AWG (20 SWG) wire. The coil formers were made from plastic pipe of 7/8 inch (22 mm) outer diameter which Ron drilled out to an inner diameter of 3/4 inch (19 mm) which gives a wall thickness of 1/16 inch (1.5 mm). The end pieces for the coil formers were made from 1/8 inch (3 mm) PVC which was fixed to the plastic tube using plumbers PVC glue. The coil winding was with the five wires twisted around each other. This was done by clamping the ends of the five wires together at each end to form one 120 foot long bundle. The bundle of wires was then stretched out and kept clear of the ground by passing it through openings in a set of patio chairs. A battery-powered drill was attached to one end and operated until the wires were loosely twisted together. This tends to twist the ends of the wires together to a greater extent near the end of the bundle rather than the middle. So the procedure was repeated, twisting the other end of the bundle. It is worth remarking in passing, that the drill turns in the same direction at each end in order to keep the twists all in the same direction. The twisted bundle of wires is collected on a large-diameter reel and then used to wind one of the "coils". How to 12volt free energi? How to constructe auto charger for fuelless generator? Why to use transformer choke with alternator generator set? How to charge lead acid batteries to be used as free energy electricity supply? How to create free energy to charge battery? Can pulse charging revive battery? Does pulsing current during battery charging help?